"IDLID Services" specializes in producing driver's license translation in accordance with "United Nations Convention On Road Traffic" requirements. International Driver's license issued by our company is an additional translation tool to aid you while traveling abroad. Along with your state or provinces original driver's license and International driver's Permit, Our International Driver's License helps to translate your driver's license information into 8 different languages, closing any language barriers and communication gaps. No matter what country you are from, our translation of your driver's license means that no matter where you are traveling, our International Driver's License will assist you in times that matter most and when language is a huge barrier. Long lasting laminated photo card and a passport-size booklet. Every card and book contains its own unique identification number along with our genuine secure hologram and micro printing to ensure authenticity and prevent fraudulent duplication of our International Driver's License. Unique security 2D bar code PDF417 feature on every license for verification. All International drivers licenses issued by us are stored in our security database. User Login to our customer portal allows easy access to check validity and status on any web browser. The International Driver License is intended to overcome the language barriers that you might encounter while traveling abroad. Eliminate the frustration of the language barrier by simply showing your International Driver's License. 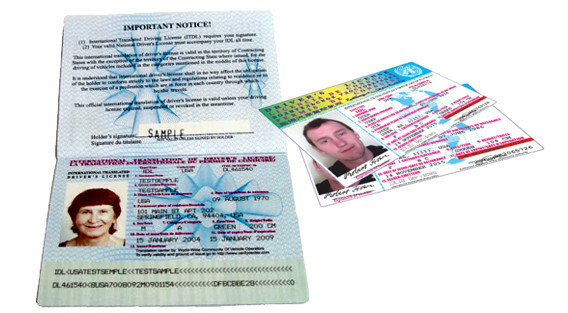 The International Driver's Permit and Original Driver's License is mandatory in many countries. Use it along with our International Driver's License to ease the anxiety of traveling in a foreign country. Check with your travel agent to the rules and regulations of the International Driver's Permit surrounding your place of travel. Penalties can vary from a fine to a citation. If your caught driving without the International Driver's Permit and Original License, law enforcement has the option of (1) arresting the driver and taking him/her to jail or (2) giving the driver a citation with a mandatory court appearance. You can upload Your photo, signature and native drivers license directly from application page and make a payment immideatelly by Visa or Mastercard. In this case Your order will be shipped due to our on site informer, that You can see on the top of this page. Printable application is also available on the APPLY page, but this will take more time to mail back Your order.